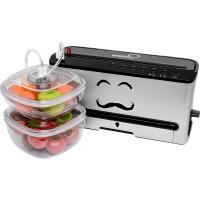 Professional vacuum sealer Dream Pro – perfect for both home and production. VDP-02 - fast and reliable vacuum any products. Whether you have a small production or you just love to harvest a lot of food for the winter (and want that they have kept all their nutritional quality) will help the vacu..
Sous-vide Dream Modern thermal circulator that allows to prepare foods in the mode of sous-vide (FR. "under vacuum") in his kitchen. The cooking temperature is accurate to within a tenth of a degree, which guarantees tasty and healthy food. 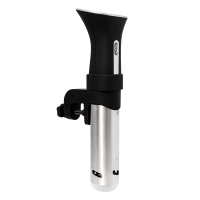 Trade without a middleman makes buying a sous vide from .. 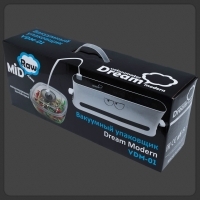 Vacuum sealer Modern Dream finally appeared in the line of useful techniques RawMID. The vacuum vessel is an important subject in the economy, helping to take care of freshness of food, and hence on human health. Exposed to air, food becomes a breeding ground for bacteria. Vacuum packaging greatl..